Click here to see examples of woodworking vises. When someone mentions bench vises, the first thing that comes to mind are the large cast metal industrial bench vises that often sit on top of workbenches. 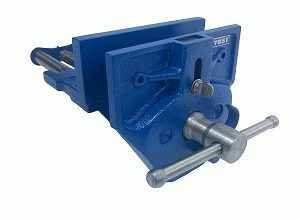 While this type of bench vise is the most common, there are other types that are more specialized that are also commonly used. One such type of specialized bench vise is a woodworking vise, which is also commonly referred to as a woodworker’s vise. These come in handy for a variety of woodworking projects and are used by everyone from luthiers (guitar builders) to furniture makers to hobbyist craftspeople. The woodworker’s vise has many advantages over a conventional bench vise. Perhaps the biggest advantage of a woodworker’s vise is that it is relatively atraumatic to your work piece which is particularly useful when your work piece is prone to scratching or damage (such as a piece of wood or glass). So how is a woodworking vise different than a traditional bench vise? The biggest differences are in the jaws and mounting location. Compared to a regular old bench vise that has small jaws that are usually metallic and often textured, woodworking vises have large flat jaws. Most often, users of these types of vises will install their own jaw covers made of wood or plastic which can easily attached to a woodworking vise using the screw holes in the jaws. Having soft wooden jaws rather than hard and abrasive metal jaws means that fragile parts will be better protected. Furthermore, the size of the jaws spreads out the load by increasing contact area and reduces pressure damage to the work piece. As for mounting locations, most regular bench vises mount on top of the workbench via a pedestal mount. Woodworking vises on the other hand often mount on the underside of the work bench and are positioned to the side of it (we suggest using some care when choosing your mounting location so you don’t bump your hip against your vise as you walk past). When it comes to finding a high quality woodworking vise, you don’t always have to spend a ton of money. In fact, often times spending big bucks only buys you a big name brand without enjoying the benefit of any additional quality, warranty, or features. The good news for you is that we have done most of the legwork so that you don’t have to. Below are our picks for the best woodworking vises for the money. When it comes to the most well known vise names in the business, Wilton is usually at the top of the charts. Their vises are high quality, and range in application from industrial vises to machining vises. Their Heavy-Duty Woodworking Vise is no exception to their high quality status quo. First, the Wilton 63144 features 4-inch by 7-inch jaws with dual screw holes for mounting any custom jaw covers you want. Thanks to the rapid acting nut, the vise can be opened to a maximum width of 10-inches very quickly with very few turns of the chrome handle. 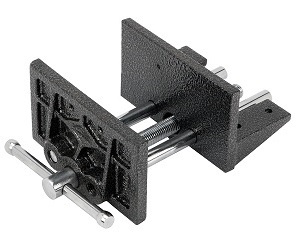 The vise comes with a mounting flange that makes installation on your workbench a breeze. Overall build quality is exceptional with nice fit and finish. Actuation of the handle is smooth and doesn’t feel gritty or sandy like many cheaper vises whose lead screws can become contaminated with grime easily. 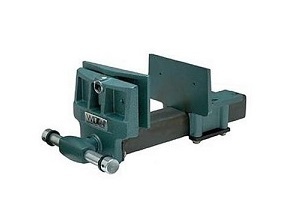 For an all around great woodworking vise, you can’t go wrong. This vise does come at a bit of a premium though compared to our other favorites, but it is justified due to the quality. Click here to see more pictures, read more reviews, and see prices! 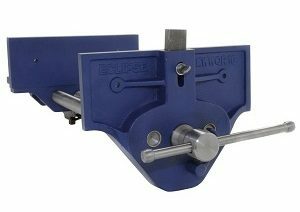 The Eclipse Woodworking Vise is a nice vise with some great features at a middle of the road price point. First, fit and finish is nearly on par with the Wilton above, although we wouldn’t consider this vise to be quite as heavy duty. The body and handle seem a little bit lighter weight, but nonetheless, this vise is ideal for any type of hobby work. The body is cast iron that has been powder coated in royal blue. Fit and finish is solid with no chips or blemishes out of the box. The casting is well executed with smartly places reinforcements. Overall, the action feels great when turning the handle. The jaws are available in a couple different sizes including 3-inch by 7-inch, 4-inch by 9-inch, and 4-inch by 10-inch. Price edges up slightly the larger you go, but going larger with this vise is not cost prohibitive as the price increments are small. The jaws also have mounts so that you can make custom jaw covers. One particularly cool feature is the quick release trigger, which opens the vise rapidly without requiring actuation of the main screw. This can save considerable time if you are doing repetitive work where you have to switch parts out quickly. The vise also sports an adjustable front stop, which is another nice to have. All in all, we really dig the Eclipse Woodworking Vise as you get a lot of bang for your buck. It’s a great mid tier vise with a lot of top tier features. Without a great entry level woodworker’s vise, this article would feel incomplete. Fortunately, Performance Tool makes a terrific vise at a killer price point. This is the smallest of the vises we like, however it gets the job done. At 2.38-inch by 6-inch, the jaws on this vise are large enough to complete most woodworking tasks in a hobbyist garage, although if you run a full woodshop you may opt for something slightly larger. The castings aren’t particularly pretty, but they are functional and include mounting holes so you can install your own jaw covers. The finish is decent, with evenly applied powder coat and a chromed handle. The action on the vise is smooth, although the handle doesn’t have a ton of length so if you need to grip something extremely tightly, you have to put some effort in the be able to generate enough torque to get the vise to clamp down. Perhaps the thing most worth celebrating about the Performance Tool Woodworker’s Vise is the price. The price is extremely affordable. If you are willing to compromise slightly on performance, while still getting a great vise, the price can’t be beat. Overall, we think you’ll be highly satisfied. We hope this breakdown of the best woodworking vises has been helpful. While these vises are our favorite, it’s important to remember that there are many options out there so if none of these feel quite right for you, click here to have a look at some of the other woodworker’s vises available on the market!